It took me a long time to finish this painting. I had trouble with the background. There were too many little shapes and colours and it was too complicated. This is the simplified version, so you can imagine how busy it was before. Not my favourite painting. Here come the birds. 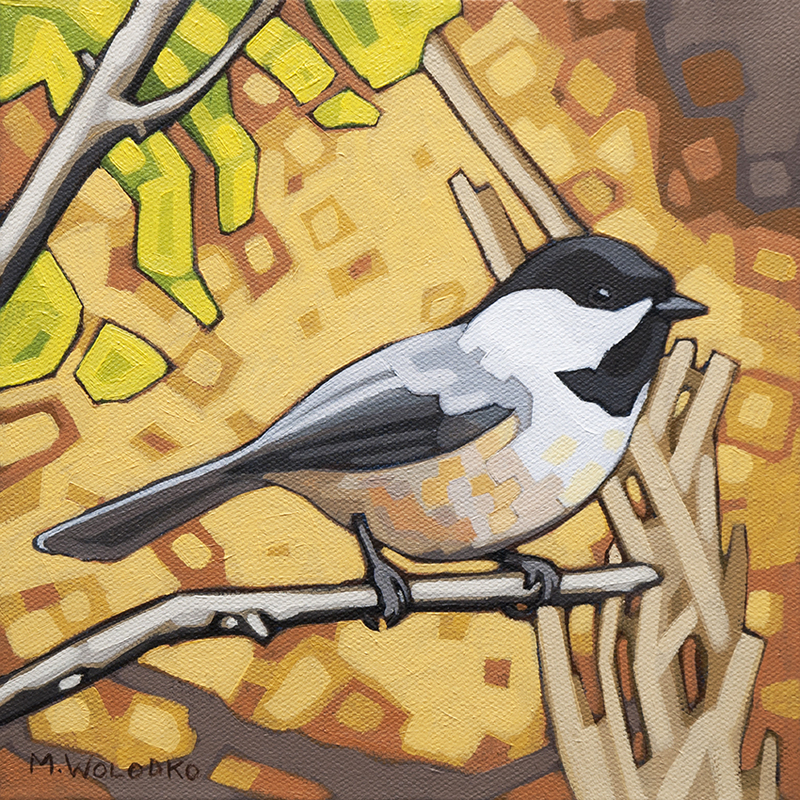 I am very lucky to live in a place where birds stay year-round. 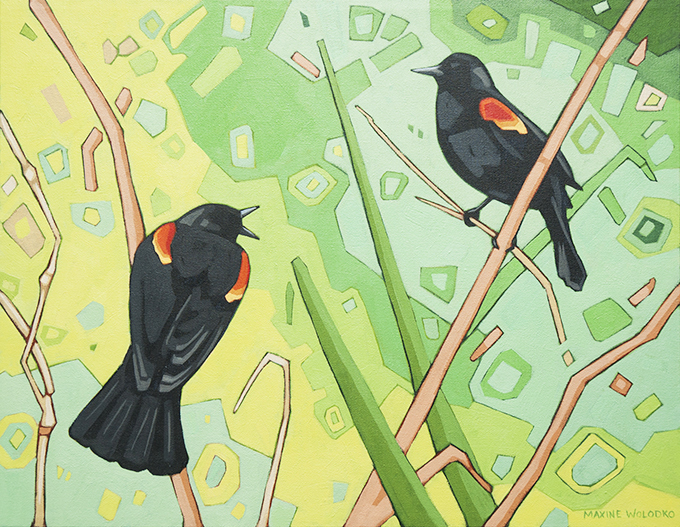 Lots of ideas and inspiration for little bird paintings to come. The boy in this meadow is my son. This is how the meadow looks in the spring with lupines and buttercups blooming. It’s full of birds, insects and frogs, which makes it one of his favourite places. I had some trouble with this painting. It is an overcast day and the lighting is very flat. I am used to adding dimension with highlights and shadows, but in this picture they are very subtle. I’m not sure I succeeded with this painting – something to keep working on I guess. It has been a very grey, rainy fall here in Vancouver. Maybe this painting will help to brighten things up a bit. 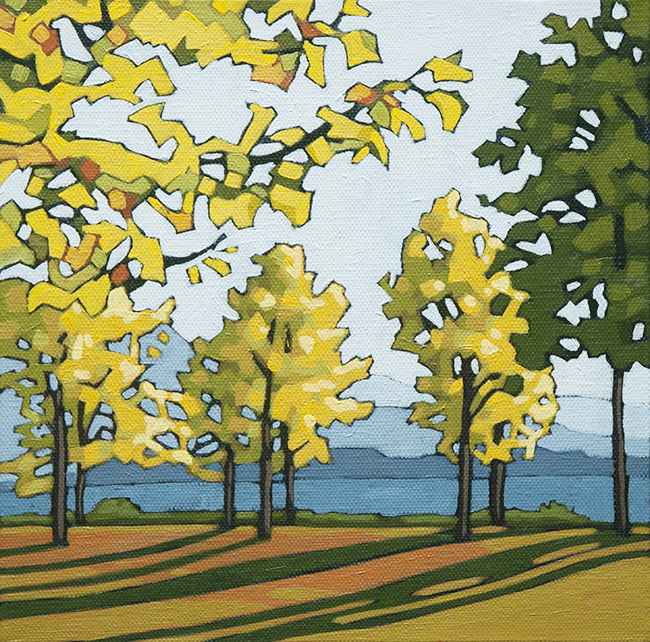 Once again, I’m painting Jericho Park. I never get tired of it. Here’s yet another picture of autumn in the park. I can never seem to capture the varieties of colour – endless shades of orange, fading to yellow, changing to green with a bunch of pink and red thrown into the shady areas. Rather than trying to do it all, I find it’s best to pick a direction and go with it. I decided to let the gold and yellow dominate in this one. 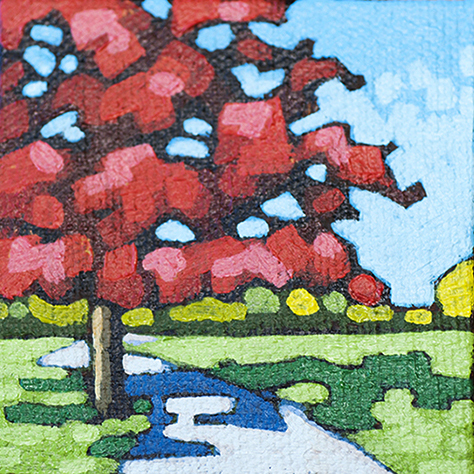 The latest in my series of tiny paintings. They keep me painting when art time is limited. Yes, it’s another tree. 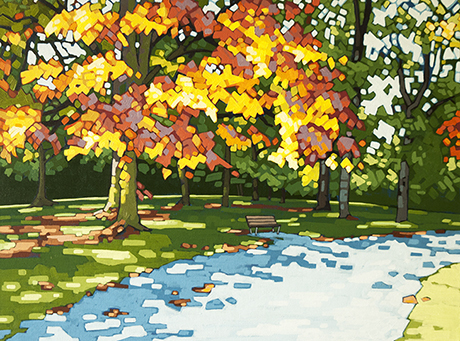 I love painting trees, but I am quickly running out of names for these paintings. My titles tend to be descriptive, so how many ways can I possibly describe a yellow maple in the fall? Or an orange oak? I am open to suggestions. I’ve zoomed in on a detail here to show the brushwork more clearly. I kind of like the composition I accidentally made with my cropping. 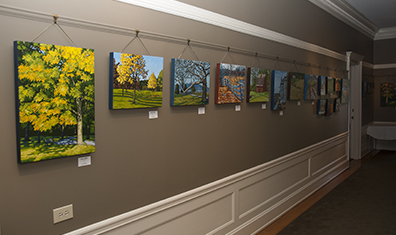 I want to thank everyone at Hycroft for having my work up this month, and to everyone who attended the opening on Sunday. Great to meet so many nice people! I love painting trees. That is not to say that it’s easy. 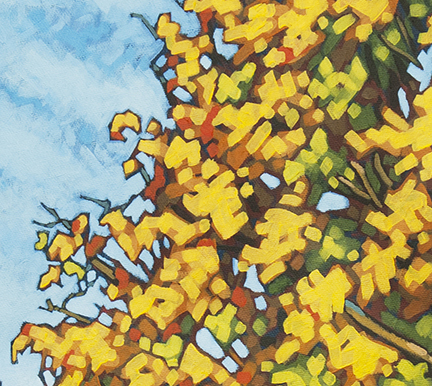 I chose to paint this complicated tangle of branches for practice. 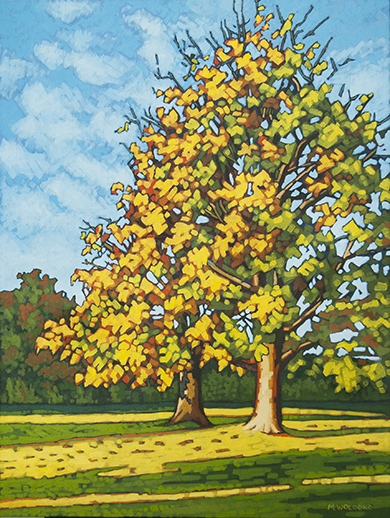 I would like to do another painting of these trees in the fall, when the leaves are bright red. 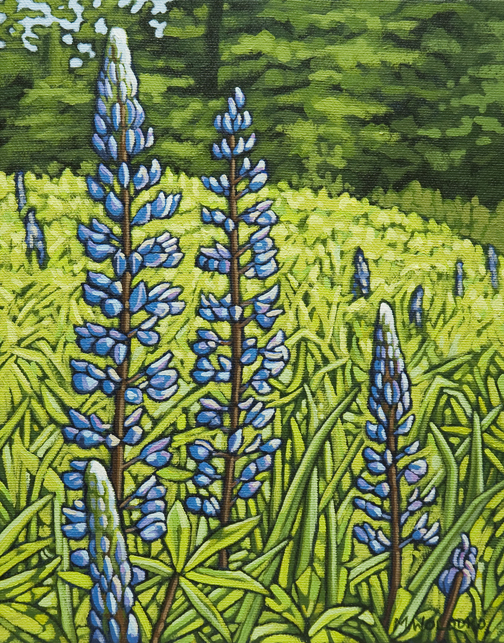 Lupines, Jericho Park 10" x 8"
I had a bit of trouble with this painting but after sitting with it for a week, I don’t mind it so much. 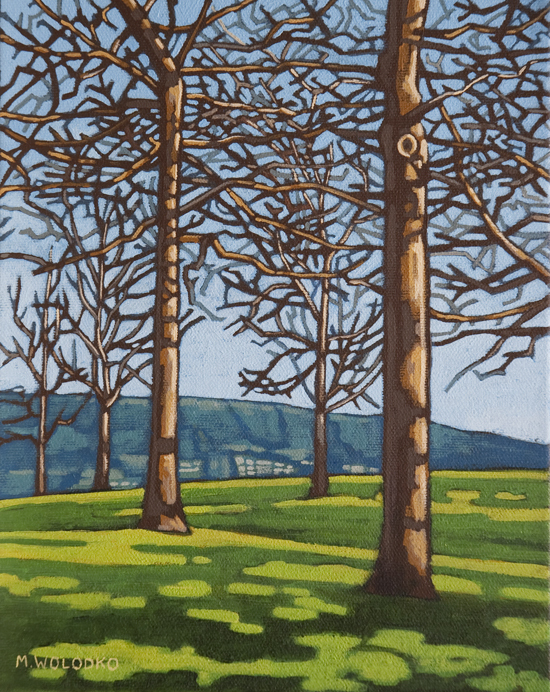 I often struggle with paintings where both the foreground and background are full of complicated shapes. 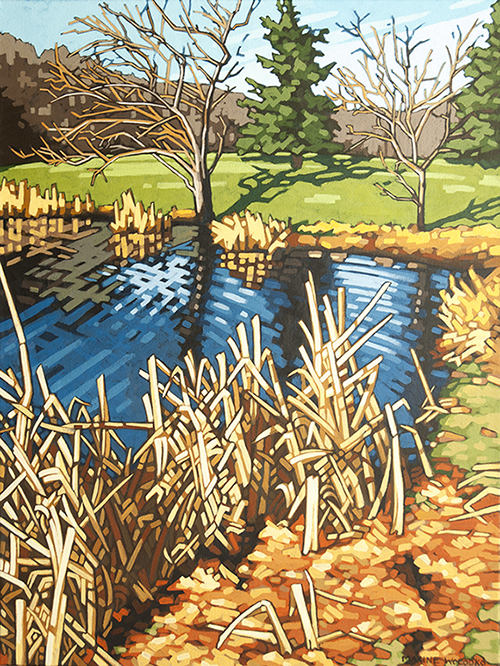 I had to keep reminding myself to simplify and not to paint every leaf and blade of grass. 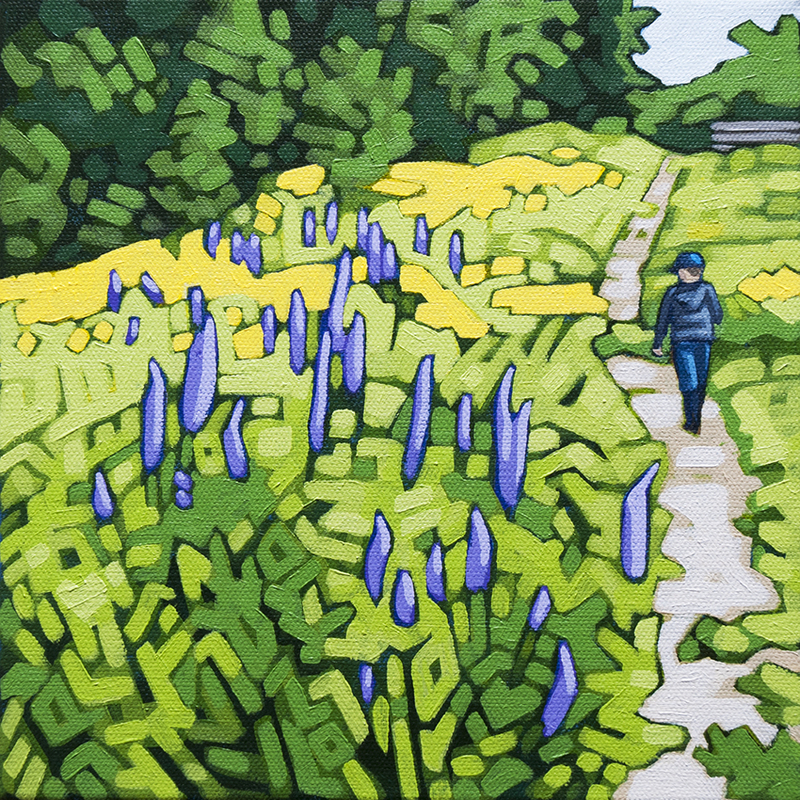 These lupines grow in a wild field in Jericho Park. In June, it is a lovely sea of purple and you can hear a steady buzz of happy bees.